There’s so much good guitar info online, it’s hard to know where to get started. These 10 guitar blogs should be a good beginning to broaden your playing, learn about gear, and keep up with the community. So click through to a few of the sites and get inspired. A great over-all site, with lots of material for learning jazz guitar. There are eBooks and courses, but lots of free blog content with lessons, how tos, and other stuff. I recently wrote about Reverb.com, where you can buy and sell music instruments, gear, etc. Their blog is great. So many interesting articles on everything from artist interviews to instrument history. Stewart-MacDonald supplies guitar parts and luthier tools. But if you check out their “Trade Secrets” blog, you’ll find a wealth of information on how to tweak, care for, and otherwise love your guitar. A guitar shop with a nice blog reviewing acoustic guitars. A good pace to check out if you’re thinking of buying an acoustic and want to see some video reviews. A long-running blog covering all sorts of guitar stuff – from gear to goofy. Lots, and lots, and lots of guitar pictures! If you’re into just seeing all sorts of guitars, this is the place for you. A classical guitar-oriented site, with lots of high quality material on classical guitar music, players, and guitars. A store in Bozeman, MT with a seriously cool acoustic guitar blog. 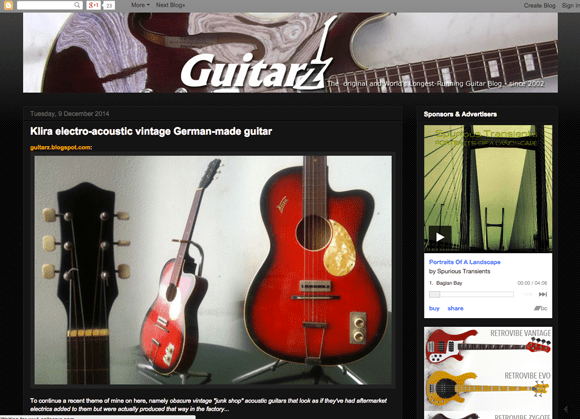 Premier Guitar’s blog page is a ‘meta’ extraction of all the recent posts from their array of specialist blogs. Find info on acoustics, pedals, vintage gear, etc. A team of experts with the aim of helping guitarists of all abilities find their perfect guitar, and all the gear that goes with it. The personal blog of David Gore, editor and write for Premier Guitar. His in-depth and somewhat eclectic posts share insight into someone obsessed with music theory, technology, and good music. Lots of lessons and eBooks. Got more suggestions? Put ’em in the comments below!